Q. For most of the year my horses live out full time on pasture. In the summer their water trough grows a lot of algae. Is it okay for them to drink from the trough when it has algae, and what can I do to stop it growing? Placing a shade structure over troughs can help reduce sun exposure, slowing algae growth. However, this obviously incurs a cost and might not work in all trough locations. Emptying and scrubbing troughs is effective, although arduous. Use a scrubbing brush or old stiff grooming brush for best results, and rinse out before refilling. I once had a hoof trimmer ask me to empty my water trough a few days before my barefoot mustang’s appointment. The horse had feet like iron in the summer, and standing in moist ground every time he drank for a few days before a trimming appointment made the trimmer’s job much easier. Unscented chlorine bleach can be added to troughs at a rate of 2 to 3 ounces per 100 gallons of water. The chlorine will burn off gradually in the heat, so you will need to repeat this weekly—sometimes more frequently--in hot regions. Make sure the bleach is mixed thoroughly throughout the trough before allowing horses to drink. Similarly, you can add copper sulfate to reduce algae growth. This comes as a crystal and often needs to be dissolved in warm water before being added to the trough. For a 300-gallon trough, dissolve half a teaspoon in 1.5 ounces of warm water, and then pour the solution evenly into the trough. Again, ensure it’s incorporated well before giving horses access. 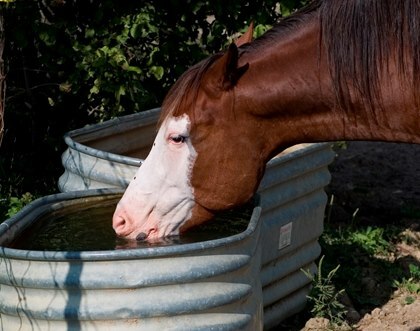 An important consideration if your horses share their water trough with other animals: Copper is very toxic to sheep, although safe for horses, cattle, and dogs. Avoid this method if your horses share their water source with sheep. Zinc sulfate is another option. If using this additive, dissolve 1 cup in 1 gallon of warm water before adding to a 100-gallon trough. Commercial additives for ridding troughs of algae do exist. Many include copper sulfate as an ingredient. Follow the manufacturers’ recommendations for use. Adding gold fish to your troughs can help reduce algae, although in areas with abundant bloom the fish might not keep up. Regular gold fish are cheap and work well; some people like to use plecostomus, which are known algae eaters. There are many types of plecos, so make sure to select one that will do well in your trough environment. If you’re using fish, keep in mind that oxygen availability in a trough is often low and might not support very many fish. Troughs need to be deep enough so the water does not become too hot, and ice will need to be broken daily in the winter. Check your trough often for dead fish that might release toxins into the water, and don’t forget they’re in there when you turn your trough over to clean it by hand! I recently had to go on a rescue mission for a friend who turned her trough over having forgotten that her nephew had put his goldfish in it. Although not fully understood, it’s thought that when submerged in water and exposed to sun barley straw emits a chemical that retards algae growth. It won’t kill existing algae but appears to prevent new growth. According to work done in Great Britain and at Pennsylvania State University, straw should be added to troughs before algae is seen. How quickly it works depends on the water’s temperature, with it taking several weeks at 50o Fahrenheit but only one to two weeks when water temperatures rise to about 70o Fahrenheit. Researchers recommend using about 10-25 grams of barley straw per meter of surface area. Don’t add more straw than this if fish live in the trough, because it can deoxygenate the water, thereby killing the fish. Place the straw in netting and anchor it at the bottom of the trough. Premade balls are available for purchase from pond supply stores.